After a little break on his way from Asmita's place in India, Secret Squirrel is here again and has travelled across continents again to arrive in Europe. Do you remember the five acorns Asmita from Elephant in the study passed on? 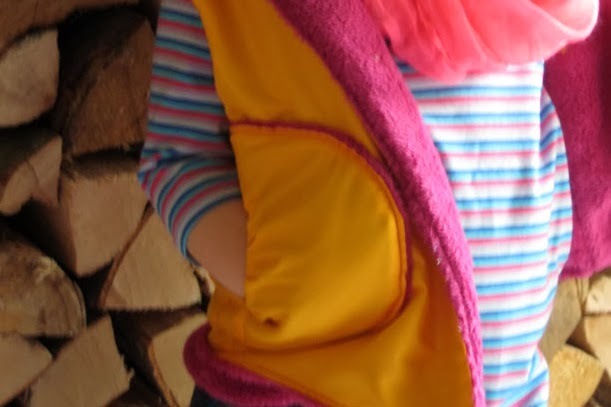 An and I have been given a sneak peak of the next blogger's outfit - it looks so colourful and fun and I can't wait to have a better look...HERE! Remember, if you would like to host the next month of Secret Squirrel, please head over to this blogger's post and leave her a comment to let her know!! If you are new to Secret Squirrel, you can read all about it here. There are only a few stops left before Secret Squirrel returns home to Belgium, so jump on board! You can see more Secret Squirrel sewing in the flickr group too - thanks so much to everyone who is sewing along - I hope you are enjoying it! What a wonderful outfit! Love it! Such happy colours, and such lovely details! Love the jacket. Great outfit!